August 31 -- Approximately 500 people attended a rally early Saturday to protest the proposed decertification of beds and elimination of several departments at North Shore LIJ's Glen Cove hospital. 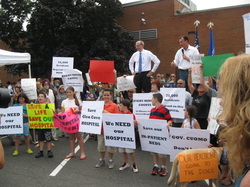 The rally, the second this month, was held in the parking lot behind Glen Cove Library where a stage and sound system were set up to allow local leaders, community members, and hospital workers and doctors to address the crowd. The message of the event was clear as speaker after speaker reiterated the point that the community has to continue pressing hospital officials and government leaders to not allow North Shore LIJ's proposals for the hospital to be fully carried out, and to demand that the process take place in public view. Glen Cove Mayor Ralph Suozzi, who emceed the event, said that the petition he started in early August now has more than 18,000 signatures. Citing North Shore LIJ's recent statements that the hospital system was not seeking to decertify all beds at the hospital, Mr. Suozzi said that he believes the public's response to the proposed changes have had an impact. However he stated that the community needs to continue pushing. "We don't want a pacifier - we want a functioning hospital!" He declared. Bayville Mayor Doug Watson repeated Mr. Suozzi's position that the community needed to keep the pressure on and that the issue needs to be kept in the public mind. Dr. Eric Hochberg, who has worked at the hospital since 1990 pointed out the irony of North Shore-LIJ closing the only hospital in the system located on the North Shore. He repeatedly asked, "Why close this hospital?" He stated that the hospital is profitable and has among the highest patient and employee satisfaction rates in the system. He questioned the decision to move the orthopedics department to Syosset when the one at Glen Cove it is of such reknown, he stated, that doctors from around the world visit it and view it as a model. Former County Executive and current candidate for the same position, Tom Suozzi, stated that this needs to be a public process and stated that the city may want to use the courts to block some of the proposed changes. He was quick to point out, however, that he believes that North Shore-LIJ system is a wonderful one, but disagrees with the current proposals. "Let's make this clear," he stated, "we love the system - but this is a bad decision. This is a botched process." Mr. Suozzi also stated that this is an issue that does not breakdown along party lines and one in which he and his potential opponent, should he win the Democratic primary on September 10th, County Executive Edward Mangano agree upon. Mr. Mangano sent Raymond Thomas, Director of Nassau County Office of Housing &. Intergovernmental Affairs, to speak on his hehalf. He said that Mr. Mangano had posted a petition to save the hospital from downsizing that could be accessed through the Nassau County website and encouraged people to urge at least eight friends to sign it. Assemblyman Charles Lavine stated that he wanted this to be a public process and emphasized the economic importance of the hospital to the community. The hospital he stated, has a payroll of $230 million, makes $109 million worth of purchases, and makes several million dollars of capital improvements, and is thus an important economic contributor to the community. Like Mr. Suozzi, Mr. Lavine praised the North Shore LIJ system for the quality of medical services it provides. "We are not going to war with the system." He stated. "It is one of the leading hospital providers in the United States."